The general consensus I’ve gotten from Facebook posts and talking with friends is that people are not that excited for the “big game” this year. Some have blamed the lack of excitement on the cold, blizzardy weather, their favorite team not getting in, or that fact that we just saw the Steelers in 2009 (no offense, Colette). 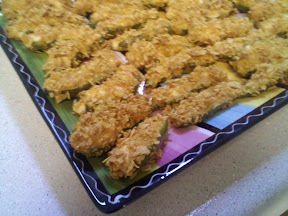 Spicy serrano peppers stuffed with creamy cheeses and battered in crunchy corn flakes. 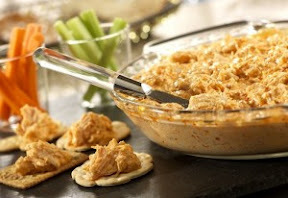 If you like hot wings, BEWARE of this addicting chicken dip. Wrapped in bacon and the favorite of a certain NFL kicker…need I say more? An awesome discovery at last year’s Superbowl party….HAD to get the recipe. Thanks for scrambling to get it for me, Sasha! Pictures to come when I make it on Sunday! What are YOU making for Superbowl Sunday? I’d love to hear your ideas. Denise, Just had to tell you Jaren and I tried Frank’s Buffalo Chicken Dip… He actually made it and DOUBLED the hot sauce…. Very tasty great success and Jaren says he will definitely make it again and again! Thanks for sharing! Yay! I’m glad you guys liked it! And good for him for cooking! I sure miss seeing you and your boys everyday. I made a Jalapeno popper dip yesterday that I think he might like. I will try to post it soon….hope all is well!